Rediff: Unimpressive Ram, a cop so tough he wears only two inscrutable expressions. My heart goes out to his fans that will have to sit through this tediously trashy film. IBN Live: Ram Charan comes off as stiff as a wax statue in his Bollywood debut, which barely any emotion, forget brooding anger. His biceps pop out of his uniform, but he barely flexes his facial muscles. DC: Ram Charan doesn't look like he is made of flesh and blood. He looks pasty and his face is uniquely two-dimensional- he resembles those virtual creations, the guys who get energized on hand-held play stations at the press of few buttons. 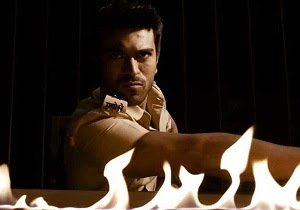 ZEE News: Ram Charan Teja seems to have just remembered to sulk for the most part of the 'angry young man' he is supposed to portray. Hindustan Times: I haven't seen any of Ram Charan's films but here he works with just two expressions. Indian Express: Ram Charan is more fumble than finesse. Mid-Day: Oh yes, Ram Charan has a great body and walks around like a cat with hangers for shoulders. But alas, that obviously is not enough. Only if he had watched the 'Zanjeer' DVD again and again.